The generous donation has enabled the Scouts to construct a covered activity area which will act as a much-needed extension to their Hedley Hall base. The area will help the six sections of Beavers, Cubs and Scouts to expand the range of activities they are able to perform, particularly in bad weather. With the extension comes an outdoor kitchen area which will be used throughout the year. The new facilities were first used to host the Scouts hugely successful family Bonfire Night event, with guests enjoying traditional fireworks from the hut. 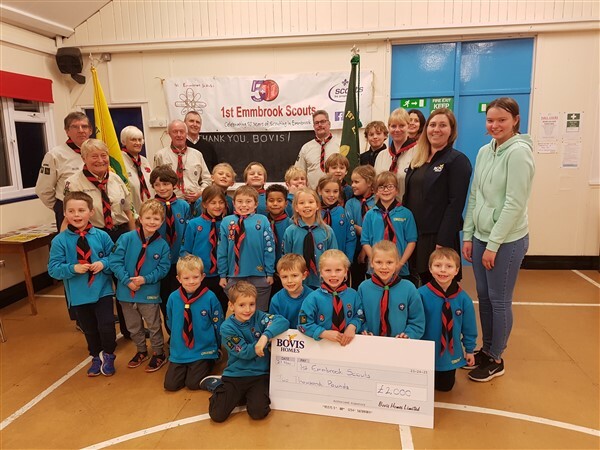 Martin Wilson, who has been Group Scout Leader for over 25 years said: “"The 1st Emmbrook Scout Group is very grateful to Bovis Homes for contributing to the cost of the new outdoor covered training area. We have been trying to get a bigger headquarters for many years because the current one is just not big enough. We have 140 Beavers, Cubs and Scouts with 24 adult leaders and the new covered area will allow us to provide more exciting activities. It will be used as an area for outside training and will relieve the pressure on the existing headquarters”. The group has a long and successful history serving the young people of Emmbrook, Wokingham, having been established in 1964 and grown steadily from a group of under 10 members to nearly 150. It is anticipated to grow further with the new residents from Bovis Homes’ neighbouring Emmbrook Place development. Emmbrook Place is a growing development comprising 760 new homes, community facilities and public open space. For more information on living at Emmbrook Place, please contact the sales team on 0118 4181022 between the hours of 10am and 5pm, seven days a week.